The hacker group has launched evad3rs during the weekend, an update of evasi0n Untether Cydia. This package allows us to restart our Jailbroken iOS devices without having to connect to the computer. The new version (0.4 to 1) fix bugs when you restart your device. Surely, after installing evasi0n, you may have noticed that sometimes your iPhone takes too long to restart or reboot alone. To update this package all you have to do is go to Cydia, click on the "Changes" and give Reload. This package is installed automatically when you jailbreak your iOS device. Moreover, evad3rs also has released version 1.5 of evasi0n. This week we had at our disposal to version 1.4, to be able to Jailbreak iOS 6.1.2 devices with the latest software update released by Apple. This new version, 1.5, includes the improvements we have discussed the principle that affects the restart Cydia. If you have done the jailbreak, just simply follow the steps I've listed above. It then performs a backup of your iOS device in iTunes and install the latest software update: iOS 6.1.2. After following these steps, with the iPhone connected to the computer at all times (do not update your software via Wifi phone, OTA), opens evasi0n and follow the simple instructions you indicating. Moreover, if you want to update your device to iOS 6.1.2 because you are experiencing problems with the battery performance, we explain how to back up your changes in this tutorial . 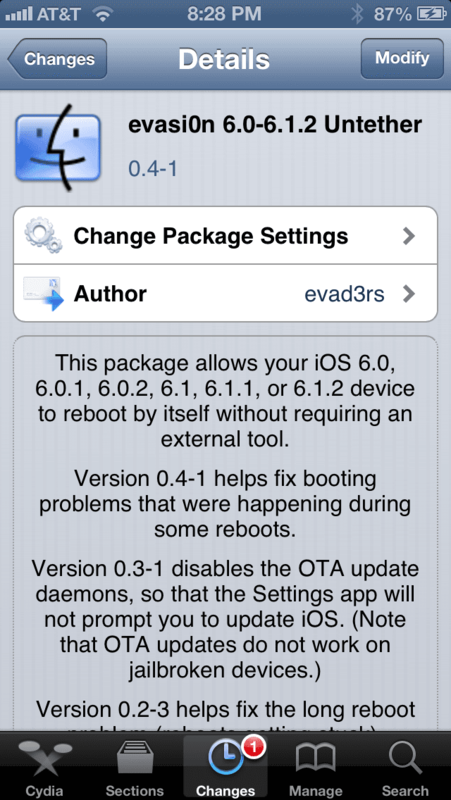 Article evad3rs Launches Version 1.5 of evasi0n: steps to upgrade was originally published in News iPhone .